While pollinators may come in small sizes, they play a large and often undervalued role in the production of the food we eat, the health of flowering plants, and the future of wildlife. 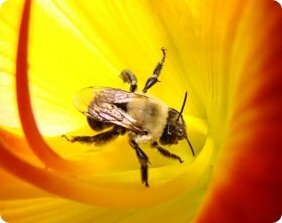 A decline in the numbers and health of pollinators over the last several years poses a significant threat to the integrity of biodiversity, to global food webs, and to human health, according to scientists. PollinatorLIVE brings the excitement of pollinators to you through webcasts, webinars and online education resources. CLICK HERE to watch Nature’s Partners: Pollinators, Plants and People webcast and broadcast from the Lady Bird Johnson Wildflower Center. Scientists and educators explain pollination, plant-insect interactions, how to study pollinators, their importance to the food supply, and what people can do to help. CLICK HERE to watch The Insect Zoo in Your Schoolyard, webcast from the National Zoo in Washington, D.C. Learn about pollination, pollinators, participatory science projects, the latest about monarch butterflies, and how to attract pollinators to your schoolyard. CLICK HERE to watch Honey Bees, Native Bees, Gardening, and More held at the Washington Youth Garden at the U.S. National Arboretum. Learn about our native and honey bees, tour the youth garden, and learn how good nutrition and pollinators are connected. CLICK HERE to watch Woodsy Owl’s Rubbish Rot Rap, the butterfly dance performed by Chikawa (in English and Spanich), and the PollinatorLIVE song and dance. CLIC AQUI para mirar Socios con la Naturaleza: Polinizadores, plantas y humanos. CLICK HERE for the web seminars held for teachers and hosted by the National Science Teachers Association about studying pollinators and using schoolyard gardens to teach science.